Usually when I go to NYC, I see as many Broadway shows as I can fit in, sometimes as many as four or five in a long weekend. On this most recent trip, I spent most of the time visiting friends in and out of the city, but I couldn't possibly go to NYC and not see a Broadway show! Most of what is currently playing I've either seen already (Once, Book of Mormon), was not available at the half-price TKTS line (ditto), or I had no interest in seeing (Rock of Ages, Annie, Mary Poppins and the like). The two exceptions are the revival of Who's Afraid of Virginia Woolf by Chicago's Steppenwolf Theater, and the five-time Tony-winning Peter and the Starcatcher, which falls in the slightly odd category of "play with music." We chose the latter, and I found it to be delightful, innovative, creative, and totally different from what you usually see on Broadway (which is a good thing in my book). Incorporating music (a few songs accompanied by keyboard and percussion, which also provide a soundtrack to the action), elements of physical theater (similar to Minnesota's Live Action Set and Transatlantic Love Affair), low-tech stage illusions, and good old-fashioned storytelling, it's a delightfully successful theatrical experiment. 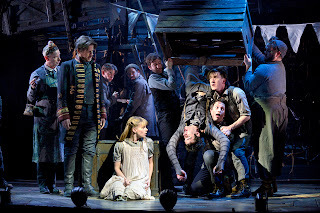 Peter and the Starcatcher is based on the 2004 novel Peter and the Starcatchers by Dave Barry and Ridley Pearson, a prequel to the Peter Pan story we're all familiar with. 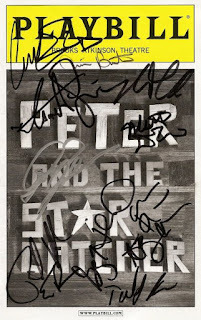 The play was written by Rick Elice and is directed by Roger Rees and Alex Timbers (who, along with several members of the creative team, was also responsible for the wacky and fun satire Bloody Bloody Andrew Jackson). The title character is an unnamed and unloved orphan who's sold into slavery along with two other boys. They're being transported on the ship Neverland, captained by Slank and his rough and rowdy crew. Also on board are 13-year-old Molly and her nurse. Molly's father, the well-to-do and important Lord Aster, has entrusted her to the captain while he travels on a more dangerous route aboard the Wasp, on a mission for the queen. He's transporting a trunk that unbeknownst to him has been swapped with a similar trunk of worthless sand by the devious Captain Slank. This set-up is explained to us largely in narration by various characters. Aster's ship is overtaken by pirates, namely the dastardly Black Stache (Matthew Saldivar in a delightfully over-the-top hammy performance). He gets the key for the treasure-filled trunk from Aster, only to find sand and deduce that the trunk with the queen's treasure is on the other ship. He orders the crew to turn around and attack the Neverland. Meanwhile, back on that same ship, Molly has befriended the orphans and told them that her father is really transporting "star stuff," that must be destroyed because of its great power to turn anyone who comes in contact with it into whatever they want to be, whether good or evil. She has a secret means of communicating with her father (they're "starcatchers! "), so she and the boys help the Neverland get caught. 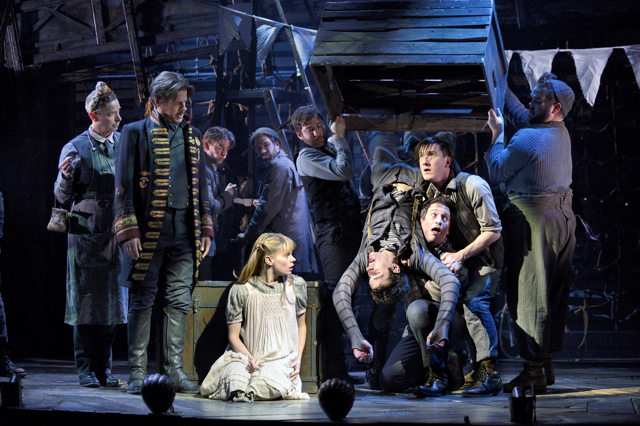 The ship splits in two and Peter and some of the others are cast overboard! So ends the first act. The second act takes place on an island, whose unfriendly native people speak a foreign tongue that seems to be mostly comprised of the names of Italian foods. Other dangers include crocodiles and sweet talking mermaids. Everyone is eventually reunited and must make some difficult decisions about what and whom to save. Molly and the orphan, now named Peter, save the day, but Peter realizes that he must stay on the island and remain a boy. He comes in contact with the star stuff and since what he wants most in the world is to be a normal boy, a boy he must be forever. The plot is wrapped up a little too neatly to make it fit into the Peter Pan story (Molly grows up to have children named Wendy and Michael, Black Stache loses his hand and becomes Captain Hook in a hilarious prolonged bit). But it's a sweet and engaging story with a heroine and a hero to root for. Each member of the twelve-person cast has many roles to play and is fully committed to the story-telling. This is the fourth time I've seen the actor playing Peter - Adam Chanler-Berat (twice in the original cast of Next to Normal and in the Off-Broadway production of RENT last year). He's such an expressive and present actor, he makes Peter someone to believe in and root for. Celia Keenan-Bolger as Molly (the lone woman in the cast) is also wonderful, believably and joyfully playing a precocious British teenager despite being a grown up American woman. Other standouts, besides the aforementioned Matthew Saldivar as Black Stache, are Arnie Burton as Molly's ever-supportive Nurse and Rick Holmes as her father. While the whole show is delightful, I enjoyed the first act more than the second. Most of the 12 actors are on stage for the entire act, playing many different roles or providing the backdrop for the scene. The ship set is nice and close in, providing an appropriate sense of claustrophobia and darkness of a sea voyage. In contrast, the island is all openness and light, and the characters are more scattered in separate groups. 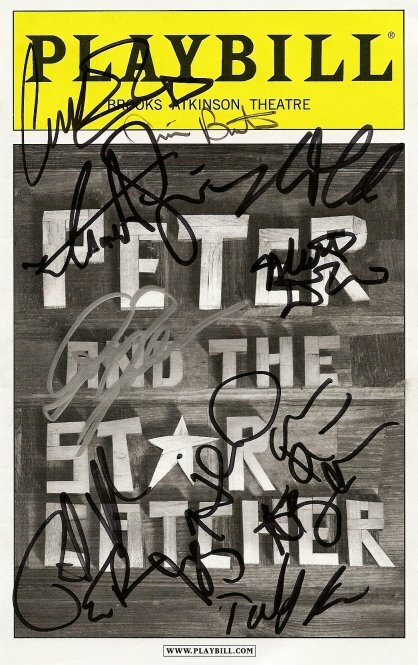 What I appreciate most about Peter and the Starcatcher is that it's a really creative and fresh form of storytelling. It was easy to get tickets to this show, as opposed to the blockbuster Newsies, which is more accessible and familiar, and therefore, sold out. I wish more people would give this show a try, it's delightful for kids and adults alike. When children's entertainment is done well, and doesn't talk down to them and spoon feed them easily digestible morsels, but rather engages their brains and imaginations as participants in the storytelling experience, it's something that children of all ages, including the hated grown ups, can appreciate.